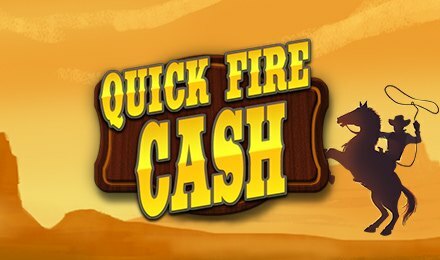 If you’re a fan of the Wild West, then this game is just for you! Perhaps, this is what inspired Instant Win Gaming’s creation of Quick Fire Cash. This game allows you to bag up sacks of gold in a blink of an eye! And the dusky environment automatically enhances the cowboy theme. Thus, making it worthwhile for you! To play the game, all you have to do is roll the dice to set a multiplier which allows you to win up to 6x your prize! Four other games will determine the multiplier you end up with. As you enter the salon of your choice, set your bets and assemble as much cash wins as you can! Coin Values: Coin values range from £0.50, £1.00, £2.00, £3.00, £5.00 and £10.00. Game 1: Click on any one of the barrels to reveal two symbols. Uncover identical ones and the prize is all yours! Game 2: Click on any one coin and reveal two numbers on the same row. If your number is higher in value, you win the prize. Game 3: You’re prompted to select a sign, if the sum is 10 on the same row, you win! Game 4: Click on the money bag, and if you’re lucky enough, uncover a stack of cash of which you will win! At the end of the game, you’re awarded with the total of your wins!